2014 Jamis Dakar XCT Comp 19" (last one left!!) Sale Price: $1750. $650 OFF!! The Dakar XCT comp is a 650B dualie with 130mm of X Fusion front and rear travel, with front and rear thru-axles, a Shimano Deore 2x10 drivetrain, Shimano M445 hydraulic disc brakes, and a Crank Bros Cobalt cockpit. It is truly a whole lot of bike for the money! 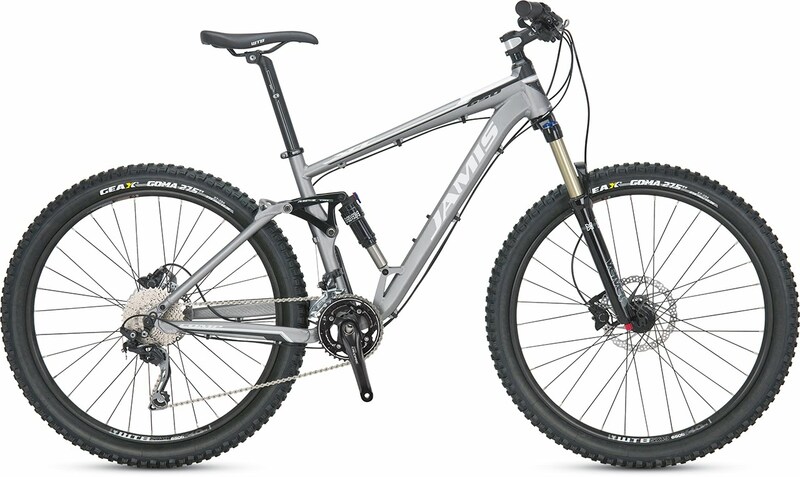 This bike was a great deal at MSRP, now it's $400 off! Other great features include: asymmetrical chainstays, tapered headtube/tapered steerer tube, GEAX Goma 650B tires, sealed cartridge bearing Formula hubs, 160mm rear rotor, 180mm front rotor, and WTB Volt saddle. The Comp features Jamis's well renowned MP4 suspension, which provides that bottom-less travel feel, and a near vertical rear wheel travel path. There's a lock-out on the rear shock, but you won't ever use it. Jamis nailed this suspension design; this bike climbs really well with the shock in the fully open position. If you're looking for a dualie and you want the most bang for your buck, the Dakar XCT Comp is your best choice!